I am baking after a gap of almost two months!! I had chosen the theme for #BundtBakers to bake a savory bundt and that is the time I felt I must get the oven back in action. 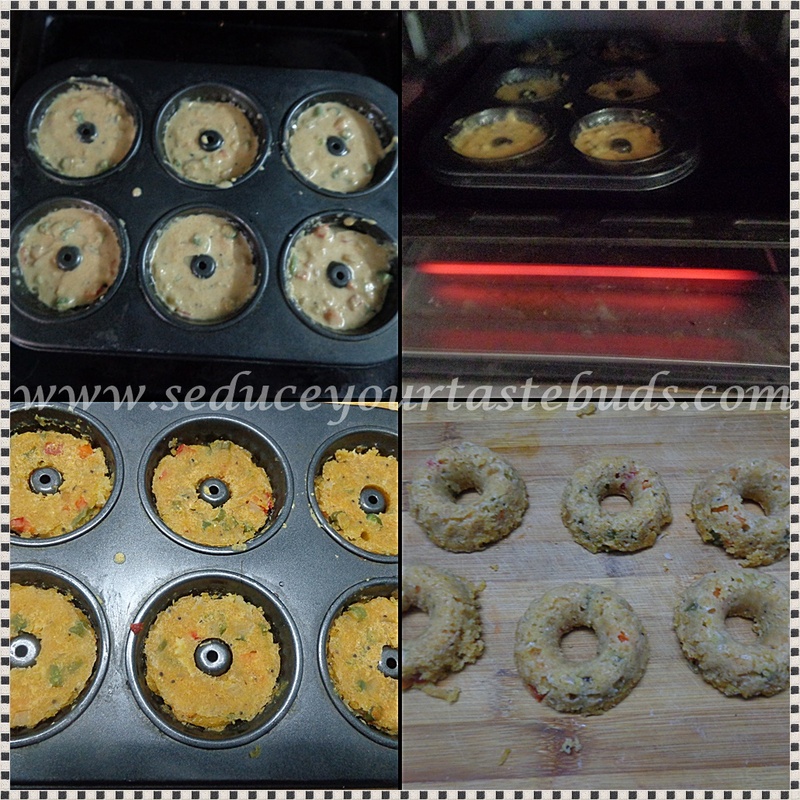 I chose an Indian flavored bundt ,one that will remind you of Upma, a semolina based breakfast dish. Upma is not so popular in our house, except hubby who loves it a lot. So baking upma changes its appearance and acceptance. Since the baked upma was highly appreciated, I made something similar but with a different base ingredient. I used fine corn grits and it gave a whole new taste to the bake. Heat oil in a pan and add the mustard, cumin, channa dal, urad dal.When the dal turns brown and the mustard pops add the ginger , garlic, capsicum, onion.Saute till onion turns soft. 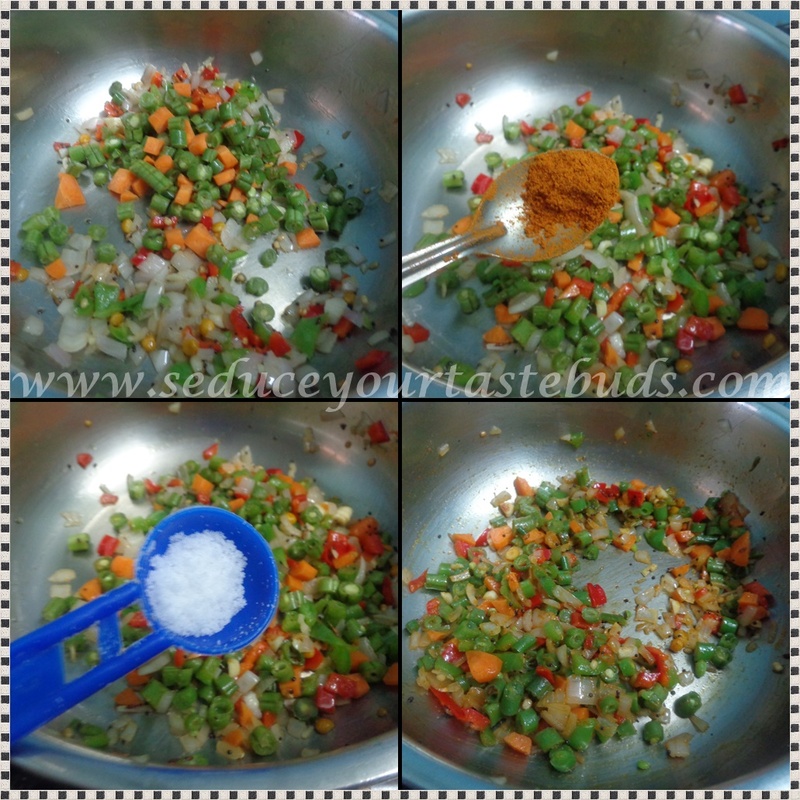 Add the vegetables and saute for a minute.Add the sambar powder, salt and cook for a minute. 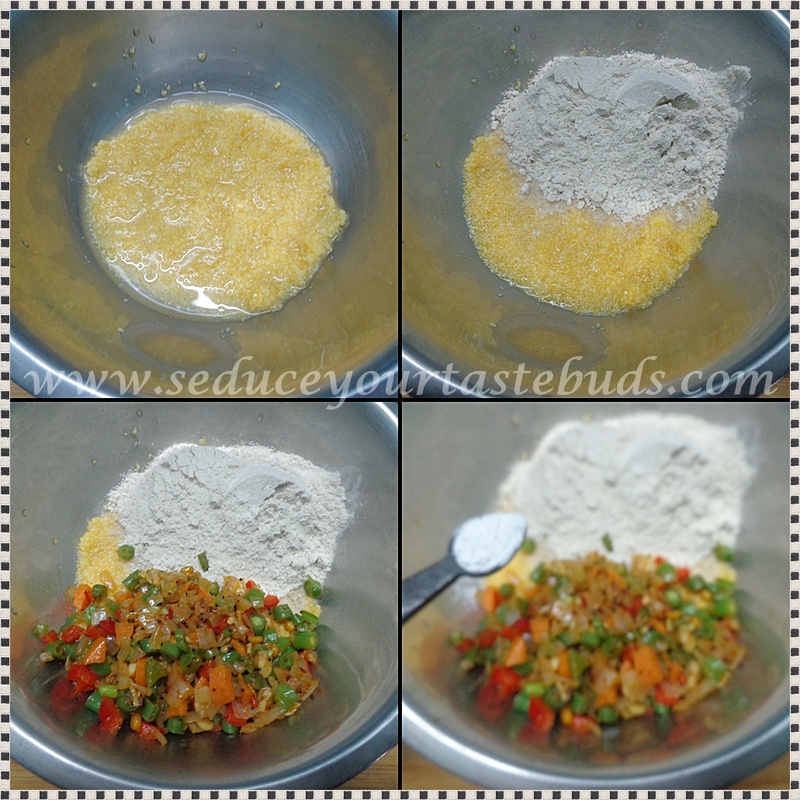 Mix well and add yogurt / curd to bring it to a thick batter consistency. If it is too thick, ajust the consistency by adding water / yogurt. Pour the batter into bundt moulds and bake in a pre heated oven @ 180 degrees for 8-10 minutes / until a skewer inserted in the bundt comes out clean. Cool slightly and serve with a side of your choice. I served this with a hot and sweet sauce. If the bundt dries out on storing, sprinkle a little water and microwave/ steam for a few minutes and serve. Bundts with a common ingredient or theme. Follow our Pinterest board right here. Links are also updated each month on the BundtBakers home page. I'm a fan of savory and untraditional breakfasts, Padmajha, so I know I'd love your spicy little Bundts! Thank you for hosting this month!